Ever since you watched Violet Beauregarde ignore Willy Wonka’s warning to not try the gum he invented that contains an entire three-course dinner: tomato soup, roast beef with baked potato, and blueberry pie with ice cream, you’ve dreamed of turning blue, inflating, and expanding into a giant blueberry just like she did! Sure, her blowing up into a giant blueberry was due to a defective part of the blueberry pie stage of the gum-chewing, and she had to be rolled away by the Oompa Loompas to get “juiced” so she didn’t explode and totally die, but it still seemed like a great idea! You’ve spent your whole life hoping this blueberry-flavored dream could come to fruition (geddit?) and now, friend, your chance is finally here (and you don’t even have to find a golden ticket or take a tour through a candy favorite guilty by an insane recluse! 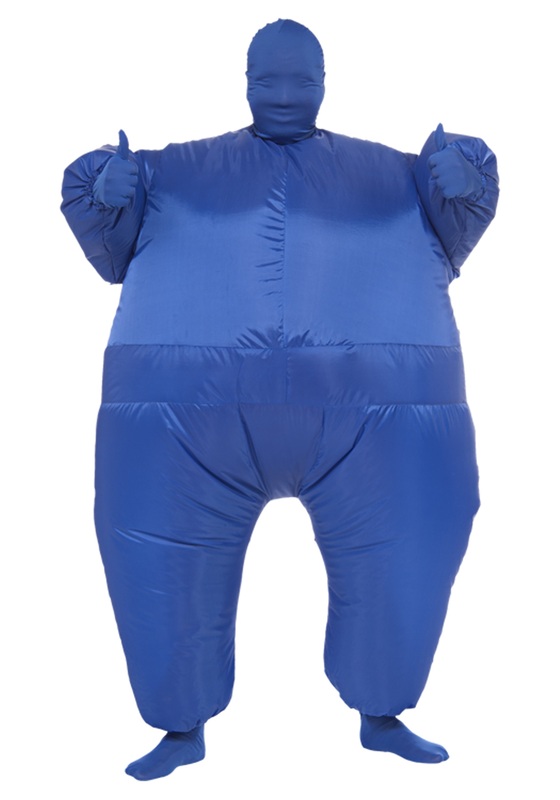 This Blue Infl8's Costume is made up of 100% polyester, keeping it comfortable and flexible for your big body dreams! A blue jumpsuit with a zipper in the back, it has a built-in fan (complete with a battery pack - batteries not included!) that inflates the suit with a simple push of a button. It even comes with a matching blue hood, blue socks, and blue gloves! Add some blue face paint and some blue shoes, and you’ll be ready to level up on your dreams this Halloween and sumo that Violet Beauregarde’s blueberry all over the place! Delicious!